While taking a leisurely, easy bike ride along the relatively flat Forbidden Drive, my daughter and I were amazed to see a young man atop a unicycle on the opposite shore of the Wissahickon Creek, tooling up and down a hilly, narrow trail. 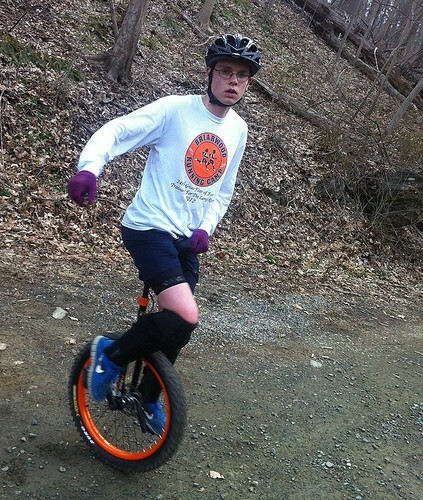 High-schooler Peter Hildebrandt took up mountain unicycling after a knee injury ended his running career. With his high end, fat-tired, disc-brake equipped mountain unicycle, he meets regularly in the Wissahickon with other unicyle friends and enthusiasts and is preparing to compete in the 2013 North American Unicycling Convention and Championship to be held in Butler, Pennsylvania this coming July. Watch video here. 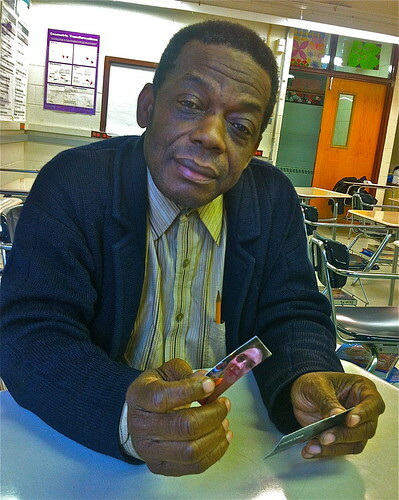 During a break substitute teaching at Parkway Northwest High School in Mount Airy, Renaud Dardignac speaks with your correspondent about current conditions in his homeland, Haiti. He laments the poor road conditions and lack of electricity that persist in Haiti, where extreme poverty existed before recent natural disasters – the devastating 2010 earthquake and the battering in the fall of 2012 by Hurricane Sandy. Making frequent return visits, Dardignac is witness to many people continuing to live in very unhealthy conditions and suffering from rampant unemployment. Like him, many of his country people live abroad, in the “Diaspora,” and send money back home to relatives who depend on this outside support. Dardignac believes the Haitian government has been looted of $200 million in assistance by certain unethical parties who have taken the money abroad and that it is in these parties’ interest to keep Haiti poor so as to continue benefiting from the corruption. 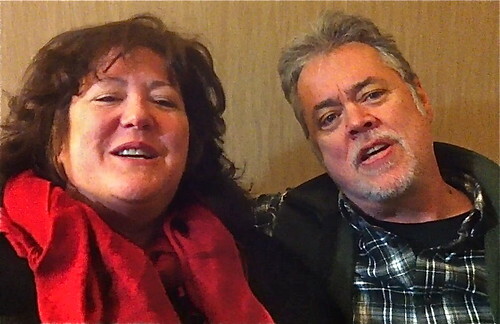 When the couple was living in Nashville, Donahue, although she had sung all her life, did not sing at all. But when she moved to Cape May, New Jersey, she and her friend Vicki Watson started a private little hootenanny group singing girlie and old country songs. When Michael moved to Cape May two and a half years ago, their friend Barry Tischler started an open mic night at the Pilot House Restaurant and it took off like gangbusters.. Since then, four separate bands have been formed out of the group and they are playing all around town, at wineries, outdoor venues and clubs. Donahue says Cape May has become home to an “amazing community” of musicians. David Meadow leads a short tour through his home, known to the Princeton NJ community as “the McCosh house” because it was the residence of the James McCosh, president of Princeton University from 1868 -1888. In recent years, the mansion had been divided into two large condominium units and last year, Meadow and his wife Lisa Mirin have taken up residence in the larger side. On Nassau it sat on a large tract of land and its owner in 1980, Architect Robert Hillier sought to tear it down for a townhouse development. The Historical Society and the community waged a battle in the local newspapers to preserve the historical house. Hillier relented, and was able to comply with regulations concerning the housing development by moving the house once again, but this time only 20 feet closer to the street. Meadow points out the elaborate, original stained glass work, woodwork, and scrollwork in the main entrance area and along the grand stairway to the second floor. When the house was moved in 1980, some of the original stucco was uncovered a curious feature was revealed: The year “1888” and McCosh’s initials where McCosh presumably had scratched them into the wet stucco. Watch video interview and tour here. 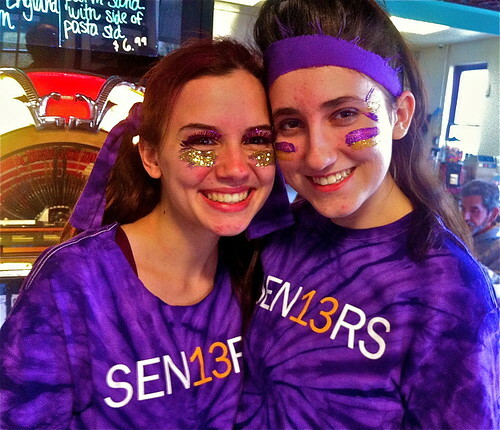 With glittery facial make up and sporting their school’s purple and gold colors, Mount Saint Joseph Academy seniors Cassidy Peikin (left) and Michelle Handy took a lunch break at Bruno’s from the school’s annual Charity Day festivities. It’s a day of fun, the girls say, and the seniors get to dress up crazily. The day’s celebration features a talent show including skits by teachers, singing and Irish dancing which Handy performed in the morning and demonstrated in the accompanying video. This year’s donations will benefit the Make a Wish Foundation and the Chron’s and Colitis Foundation. Upon graduation Peikin plans to pursue social work and Handy, to become a therapist. Watch video here.